How did you get here and why Meatpacking? Arrived here by boat from Australia…kidding. I visited NYC for the first time for a friend’s 40th in 2008 and loved it. Packed up my life in Sydney and moved right into the neighborhood. 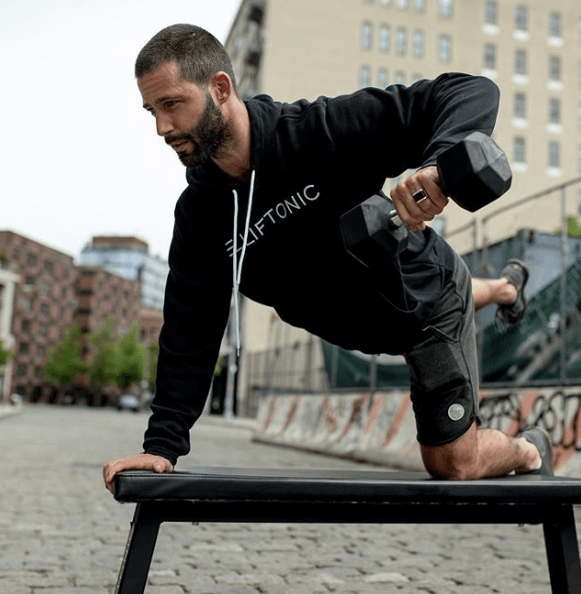 Started LIFTONIC, a group weight lifting studio, right here on Gansevoort and Hudson in 2016. Get woken up by my 7 month old at 4:30am, followed quickly by my 2.5 year old. Quick breakfast then out the door. Remainder of the day consists of meetings, calls, teaching classes then home, dinner, sleep, and repeat. If you had 15 minutes of free-time, how will you spend it in the neighborhood? Free time? What’s that?? No, I’d get a coffee at Kava Cafe or hang at RH for a bit. What are your thoughts on the expression: new year, new me? For yourself and for your clients. I’m into it actually. New Year’s resolutions get a bad rep, but any positive change, even if for a short period, it’s a good thing. At LIFTONIC, we take it much further and take people’s “new year, new me” and help them get the body of their dreams by lifting with us all year! What’s your most memorable moment or experience thus far in Meatpacking? Starting a business in such a vibrant neighborhood. Being a part of the Soho House community. Reach out to Liftonic for memberships and package specials!